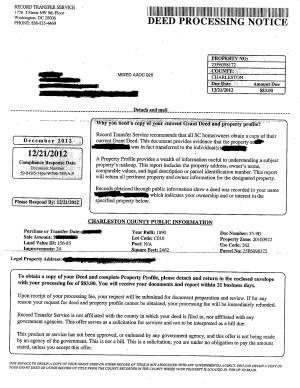 Several clients have let us know that they received a letter like the one pictured below. This service is a scam. Many counties, including Charleston, Dorchester and Berkeley, provide free online access to their imaged documents. Older deeds are available by requesting them in writing from the recorder’s office for a small fee. Additionally, we are always happy to help our clients obtain copies of their recorded documents. Some states and counties have taken steps against companies like this and the Better Business Bureau appears to be on the case. If you have questions about your closing or mailings you have received concerning it, please let us know.